See original article for audio interview and Chapter reading selections. 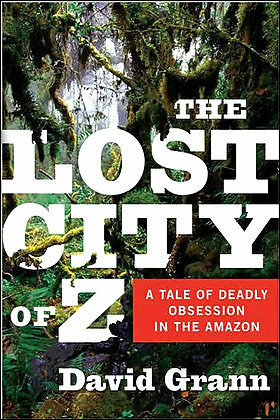 "The Lost City of Z" is David Grann's tale of an explorer's obsession with the Amazon. Is there any place so boundlessly captivating as a jungle? Its labyrinth of green. Its rich botanical promise. Its seemingly infinite swarm of life. We sit in our comfortable chairs and imagine its wonders, yet those who truly know it call it "a counterfeit paradise," for despite its allure and splendor, the jungle is profoundly hostile to man. The Inca, who once reigned over much of Latin America, keenly appreciated this. The Amazon to them was the "Antisuyo," the black hole over which they held no dominion, the slough from which their fierce enemies sprang. And so it has been throughout recorded history. The tropical rainforest, experience tells us, is where terrible things happen, where beasts rule and the best of men are likely to grow feral. Think Conrad. Think of the infamous brutalities in the Congo or the Putumayo. Think Vietnam. Among those who would have wanted you to think otherwise was the Englishman Col. Percy Harrison Fawcett, whose quest to locate an ancient civilization in the remote reaches of the Amazon became an obsession. For more than 20 years, he combed that forbidding territory -- roughly the size of the continental United States -- in search of the ruins of a metropolis with highly advanced art and culture. He called it the City of Z.
Fawcett wasn't alone in looking for colossi in the Amazon. For half a millennium, adventurers searched for Paititi, a legendary trove of Inca treasures buried somewhere between Peru and Brazil. European explorers from Francisco de Orellana to Lope de Aguirre sailed the Amazon's tributaries, hunting the gold of El Dorado. Thousands of thrill-seekers followed. And in 1925, when Fawcett, "the last of the individualist explorers," went missing in that tangle of green, more than 100 men set out to rescue him. His was, as one observer called it, "among the most celebrated vanishing acts of modern times." "The Lost City of Z," by New Yorker writer David Grann, recounts Fawcett's expeditions with all the pace of a white-knuckle adventure story. The book is a model of suspense and concision. By the end, Grann wins us over with his own hard-won experience. He has geared up, abandoned his family and climbed into the vortex himself -- stung by his subject's obsession. But Grann differs from Fawcett in two important ways: Unlike the colonel, he knows he is no match for this badland; and equally unlike him, he lives to tell the tale. What a grand tale it is! Fawcett, says Grann, "was the last of the great Victorian explorers who ventured into uncharted realms with little more than a machete, a compass, and an almost divine sense of purpose. For nearly two decades, stories of his adventures had captivated the public's imagination: how he had survived in the South American wilderness without contact with the outside world; how he was ambushed by hostile tribesmen, many of whom had never before seen a white man; how he battled piranhas, electric eels, jaguars, crocodiles, vampire bats, and anacondas, including one that almost crushed him; and how he emerged with maps of regions from which no previous expedition had returned." He was reviled by his competitors and revered by the world at large. Sponsored by Britain's Royal Geographical Society, he set out to explore the Amazon at the height of the rubber boom, when trappers were enslaving rainforest Indians by the tens of thousands, creating a human hecatomb for which tribes were seeking revenge. Anyone who has read Fawcett's chronicles -- the most notable of which is the highly colorful "Exploration Fawcett" -- will recognize the perils, real and exaggerated, that Grann recounts for us here. Apart from the human belligerents he chanced upon in his numerous expeditions, Fawcett met countless physical challenges, which he recorded in detail: sauba ants that could reduce cloth to threads; red, hairy chiggers that fed on human flesh; cyanide-squirting millipedes; parasitic worms that invaded the skin and caused blindness; "kissing bugs" that burrowed into men's lips and surfaced in their brains 20 years later. He told of candirú, needle-like fish that swam deep into human orifices -- most notoriously, penises -- and hooked themselves in with spines, causing excruciating death. He recounted wonders no one has ever confirmed: snakes that flew through the forest, singing. Grann relates all this in scenes that are interspersed with his own expedition 80 years later. By the time Fawcett made his last trip into the jungle, he was penniless, dismissed as a crank, forced to sell his story in advance to American newspapers. Grann tracks down his surviving family, hunts through his grandchildren's memorabilia and, with a broken-down samba dancer as guide, follows the secret coordinates to a remote area in Brazil called the Xingu. There he meets an American archaeologist who lives among the Kuikuro but has all the benefits of state-of-the-art instruments. He tells Grann that they are standing on a vast and ancient settlement. He shows him its moat, its palisade walls, its sophisticated geometric design, the scattered remnants of its ceramics. . . .
Grann's voyage, in other words, was no disappointment to him. Nor is it to readers. Although Fawcett's story cuts through 100 years of complicated history, Grann follows its twists and turns admirably. Thoroughly researched, vividly told, this is a thrill ride from start to finish. Marie Arana is a writer-at-large for The Washington Post. Her novel "Cellophane" is about an engineer's obsession with the Amazon. She can be reached at aranam@washpost.com.